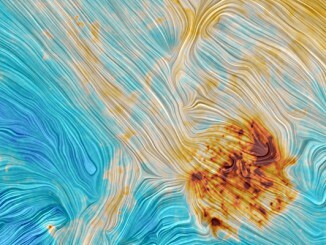 Portrayed in this image from ESA’s Planck satellite are the Large and Small Magellanic Clouds, dwarf galaxies that are among the nearest companions of our Milky Way. 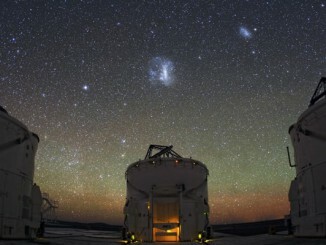 The Large Magellanic Cloud, about 160,000 light-years away, is the large red and orange blob close to the centre of the image. The Small Magellanic Cloud lies some 200,000 light-years from us. 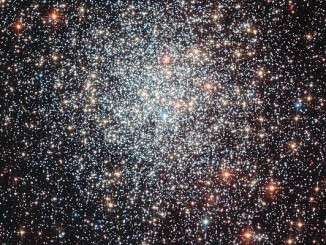 This Hubble Space Telescope image shows globular cluster NGC 1783 in the Southern Hemisphere constellation of Dorado. NGC 1783 lies within the Large Magellanic Cloud, a satellite galaxy of our Milky Way, some 160,000 light-years from Earth. NGC 1783 is thought to be less than 1.5 billion years old — very young for a globular cluster. 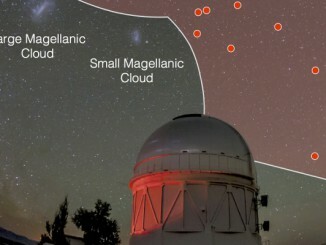 Scientists on the Dark Energy Survey, using one of the world’s most powerful digital cameras, have discovered eight more faint celestial objects hovering near our Milky Way galaxy. Signs indicate that they, like the objects found by the same team earlier this year, are likely dwarf satellite galaxies — the smallest and closest known form of galaxies.